The perfect wedding outfit goes far beyond a white dress and a veil. 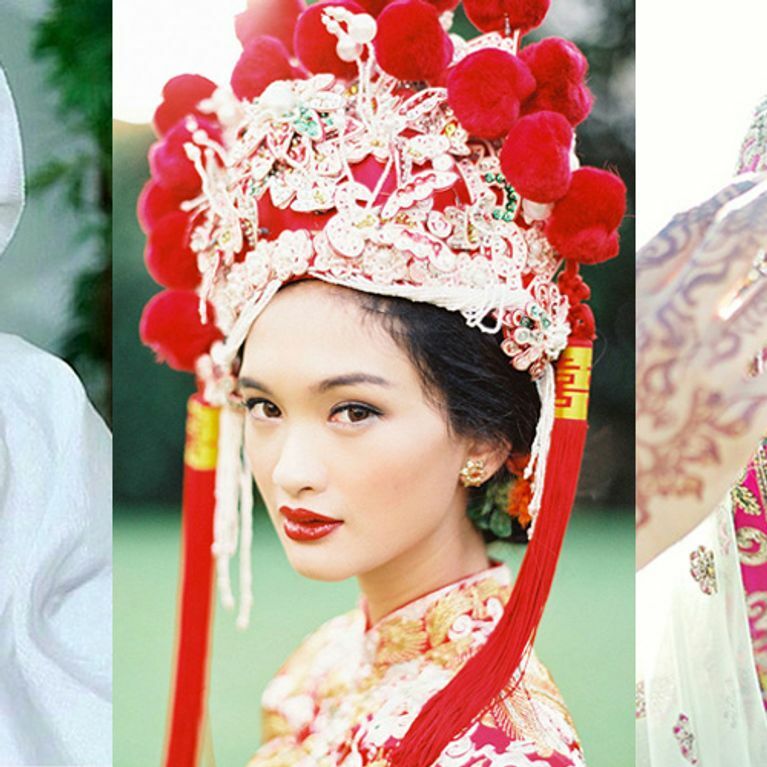 Different cultures have different traditions for bridal fashion and beauty and they don't get much more stunning than these. We've put together some inspirational pics of brides who are owning their traditional look. Yes, weddings maybe one of the most universal traditions in the world, but all cultures add their own individual style to it and each one is beautiful in their own way. A typical Nigerian wedding will see the bride change at least three times. This is the traditional “iro” and “buba” attire, which comes in an array of colours and is worn with a an extravagant head scarf , called gele. An Indian wedding is not just one day, traditionally Indian weddings can go on for 3 days, the pre wedding, the main wedding and the post wedding. It includes traditions such as puting mehndi on the hands and feet of the bride. Before the wedding day, a Mongolian groom will arrive at the bride’s house with present, which historically was animals, and he will give the bride’s father a pot of glue to symbolize the strength of relationship with the bride. In China, the brides traditional wedding dress should never be black, blue or grey as it may bring sorrow to the married life, and no one wants that. Red is the most used colour for wedding dresses, as it a symbol for love and prosperity. Traditionally, a Norwegian bride will wear a crown on her wedding day, quite rightly she is basically queen for the day. The crown would be the most expensive part of the bride’s outfit. Before the wedding the groom and his family will send the bride clothes and hair ornaments wrapped in silk for her to wear on the wedding day. The bride and groom are carried around the village streets, to the wedding venue. On the day of an Eritrean wedding the groom and his groomsmen will go to the brides family’s house to get his bride. He is welcomed with singing and dancing and he is expected to dance into the house, get his wife and they go to the venue together. A Zulu wedding, like many other African weddings is full of vibrant colours, and the beaded jewelry plays a big role on the big day. The bride and her groom will wear matching colours to show people that they are an item. The girl is claiming her man. A Ghanaian bride will traditionally wear kente on her wedding day. Kente is a vibrant multicolored fabric with patterns of bright colors, geometric shapes, and bold designs. This fabric is native to West Africa (Ghana) and was traditionally just worn by Kings and Queens.